In February, 2012, Telfair County joined 135 other communities across Georgia in earning the designation as a Camera Ready Community by the Georgia Film, Music and Digital Entertainment Office Being named Camera Ready means we have in place a program that provides film and television production companies with easier, faster and better access to local resources and location information. The Telfair County Chamber of Commerce was appointed as the Camera Ready liaison for our community. This means the Chamber is the primary local contact for production companies. The Chamber helps identify local resources, from locations and hotels to associated businesses, such as caterers and dry cleaners. Producers love Georgia for our diverse settings, talented workforce and tax incentives. Since it was created in 2005, the Georgia Entertainment Industry Investment Act has helped generate unprecedented direct investment in our state… approximately $2.4 billion with Georgia being one of the top five production destinations in the country. Some of the benefits of having films shot in Telfair County are: hiring of local residents, hotel stays and the purchases of goods and services locally. The Chamber is looking for locations to submit to the Camera Ready Program that will hopefully be considered for a film or television production site. Below is a list of sites that film and television producers look for in filming locations. ATLANTA, February 29, 2012— The Georgia Film, Music & Digital Entertainment Office, a division of the Georgia Department of Economic Development (GDEcD), designated 25 Georgia counties Camera Ready at the inaugural Film Day at the Capitol event today. The state’s Camera Ready Community Program was created to enhance Georgia’s statewide resources for the growing number of film and television productions. Launched in October 2010, the program now includes 136 counties across the state. 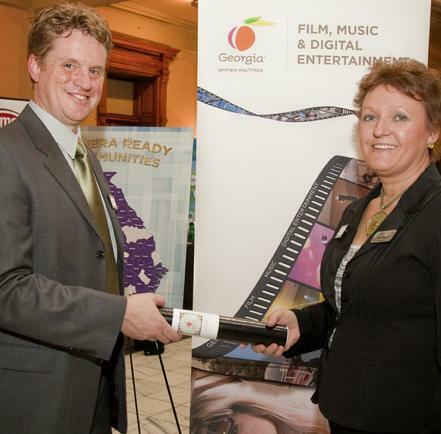 The Camera Ready program was established by the Georgia Film, Music & Digital Entertainment division to offer film and television production companies additional resources and information in Georgia communities. The program is a special designation for participating Georgia counties that are interested in attracting entertainment productions. The 25 Georgia counties that received the ‘Camera Ready Community' designation include Bleckley, Brantley, Brooks, Bryan, Clay, Crawford, Dodge, Early, Forsyth, Gilmer, Grady, Lamar, Lanier, Madison, Monroe, Oglethorpe, Quitman, Seminole, Stewart, Talbot, Telfair, Thomas, Tift, Turner and Wilkinson. From July 2010 through June 2011, more than 336 productions invested more than $683.5 million in Georgia. These projects alone generated an economic impact of $2.4 billion. To learn more about Georgia’s Camera Ready Community Program, please visit www.georgia.org/cameraready. The Georgia Department of Economic Development (GDEcD) plans, manages and mobilizes state resources to attract new business investment to Georgia, drive the expansion of existing industry and small business, locate new markets for Georgia products, inspire tourists to visit Georgia, and promote the state as a top destination for arts events and film, music and digital entertainment projects. Visit www.georgia.org. On July 10, 2012, NBC Universal Media, LLC shot 2nd unit driving scenes for a movie called "Identity Theft". Filming was done on the Ocmulgee River Bridge (US Hwy 341) in Lumber City (Telfair Co. and Jeff Davis Co) and Hwy 19 in Wheeler County. This movie is set to be released around May 2013. This filming was made possible by three counties (Telfair, Wheeler, Jeff Davis) working together.